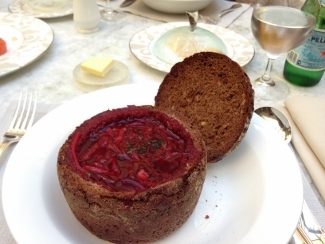 We savored the classic Russian beet soup called Borscht during our visit to the Four Seasons St. Petersburg hotel. Chef Accordi provided the recipe below. Enjoy! Place in a pot the chicken stock, add beef neck, bay leaf and black pepper. Season with salt and bring to boil. Simmer till the meat is cooked soft. Remove the meat, cool it down and cut it in 1 cm cube and reserve on the side. Sieve the stock and remove all the fat on the surface. Place all ingredients in a pot, cover with water and season with salt. Bring to boil and simmer till the tongue is cooked. Remove the tongue and while still warm remove the skin, Slice the tongue in one cm cube and reserve on the side. In a large saucepan heat the oil, add beetroot and roast well, add all the rest of ingredients and cover with the borsht stock. Simmer for 1 hour. Taste and in case adjust with the salt. Sieve the stock and keep on the side. In a large pan heat the oil, add all the julienne of vegetables and chopped garlic, roast well till soft, add tomato paste and fresh tomatoes. Add Beetroot stock and simmer for 10 minute. Before serve add cubes of beef and tongue. Garnish with julienne of green apple and chives.